With something like that rigged to his head, it's no wonder your pup can't drink. It's not fun to wear and it certainly won't help your dog blend in with the doggy crowd, but an Elizabethan collar, known as an E-collar or cone, can also make drinking water a chore. Lapping up water isn't impossible, but your pup will need a bit of assistance. Your pup is probably used to casually walking directly up to his water bowl and drinking his fill. 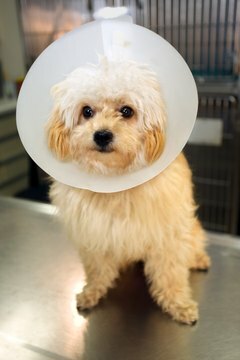 If he tries that with an E-collar, he's going to play bump the bowl with his funny looking cone. Try to get him to drink by holding your hands over his bowl or even in the water. As soon as he goes for it, slide his bowl all the way underneath his cone so it encloses the bowl. After you do this a few times, he'll learn to approach the bowl in a much more strategic manner. While it might seem easier for your pup to drink from a bowl that's on the ground, it all depends on what your dog's used to and comfortable with. If he always drank from a raised stand, he may look at you like you're out of your mind for putting his bowl on the ground. The size of your pup's E-collar goes a long way in helping him drink or causing him to tip over his bowl and look at you with those sad eyes for some water. While it's important that the collar extends past his nose so he can't lick his wounds, it should only extend by about 3 or 4 inches. You'll still need to show him that he has to put his cone completely around the bowl, but he shouldn't have a problem lapping up his much needed water. He may still cause a few spills. Sometimes the cone of shame is just too much to bear for your pup, and he either can't figure out how to drink with it on or refuses to try. If this happens, you can always remove the cone a few times a day to give him a chance to scarf down some food and lap up some water. You can feed him once or twice a day, but he'll need water several times a day. He'll probably try to take advantage of the situation by sneaking in a few bites or licks at his wounds, so only keep the cone off long enough for him to rehydrate and eat. The traditional E-collar somewhat blocks your pup's peripheral vision in addition to making drinking and eating more difficult, but alternative collars don't extend all the way past your pup's nose. No-bite collars and inflatable collars, for example, wrap around your pup's neck. They work by not allowing your dog to reach behind him, although he can still reach his paws, and his face is not protected. They're perfect if your dog was neutered or suffered an injury on the back half of his body. If you have a big, hyper pup or one who sports a long snout, alternative collars probably won't work. If you've tried assisting your dog, removing his collar or an alternative collar and he's still not drinking, contact your vet. It's never a good idea to wait it out when it comes to your pup's refusal to drink. If your pup needs his E-collar for his paws or face, don't try an alternative collar. Can You Use an E-Collar to Keep a Dog From Biting During a Nail Trim? Does Cat Litter Need to Be Changed? How Does a Cat Eat While Wearing an Elizabethan Collar?